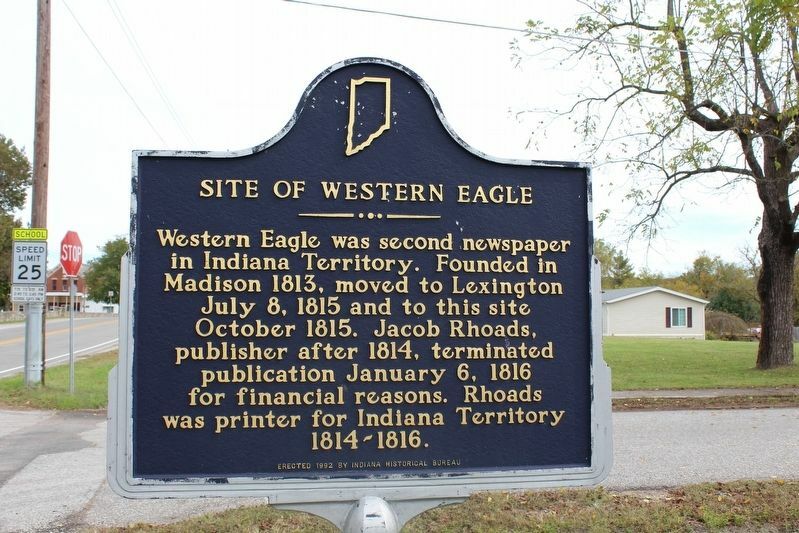 Western Eagle was second newspaper in Indiana Territory. Founded in Madison 1813, moved to Lexington July 8, 1815 and to this site October 1815. Jacob Rhoads, publisher after 1814, terminated publication January 6, 1816 for financial reasons. Rhoads was printer for Indiana Territory 1814-1816. Erected 1992 by Indiana Historical Bureau. Location. 38° 39.083′ N, 85° 37.583′ W. Marker is in Lexington, Indiana, in Scott County. Marker is at the intersection of East Main Street (State Road 356) and Mulberry Street, on the right when traveling east on East Main Street. Touch for map. 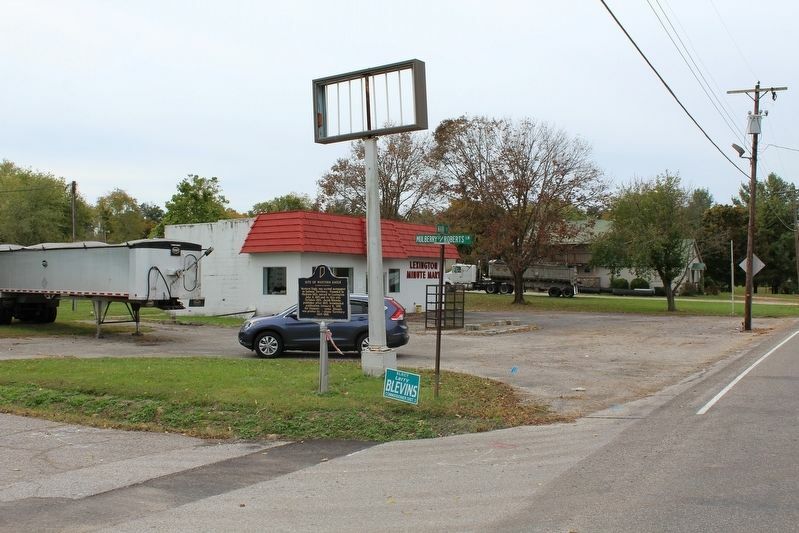 Marker is in this post office area: Lexington IN 47138, United States of America. Touch for directions. (approx. half a mile away); John Kimberlin Farm (approx. 3 miles away); Northern Boundary of Clark's Grant (approx. 3½ miles away); Morgan's Great Raid (approx. 7.7 miles away). Touch for a list and map of all markers in Lexington. More. Search the internet for Site of Western Eagle. Credits. This page was last revised on November 23, 2016. This page originally submitted on November 19, 2016, by Tom Bosse of Jefferson City, Tennessee. This page has been viewed 210 times since then and 4 times this year. Photos: 1, 2. submitted on November 19, 2016, by Tom Bosse of Jefferson City, Tennessee. • Bill Pfingsten was the editor who published this page.